Home > Education > Government Job vs Private Job: What You Prefer? The question – Government Job vs Private Job – spins the head of almost every student who is on the edge of finishing studies or is looking for a new career. If the question is asked to young students, many of them would nod ‘yes’ for a private job, but when asked to a person who is already working in a private organization, the answer would be ‘a government job is the best’. Let’s dig a bit deeper and know the pros and cons of each of them in particular. Government Job vs Private Job: Which one is better? Emerging rapidly, the private sector offers huge opportunities and opening for the aspirants, while government sector offers limited job vacancies and is, therefore, more competitive. Though government bodies gladly announce the opening of vacancies for inviting applicants, but private recruiters don’t follow it. In the private sector, there are consultancies that are hiring aspirants for various companies and organizations and helping them to clear initial rounds of the recruitment process. On the other side, the government jobs involve entrance exams for keeping the selection of the candidate completely fair. Government jobs usually demand 7 hours of shift timing from a candidate, leaving no room for flexibility. However, in the private sector, (Mostly) there are no hard and fast rules about work time and work schedule instead, the focus is to get the work done with dedication and devotion. This is the major reason why students dream about jumping in private jobs as they only visualize a lot of money besides considering other benefits that can be availed over a long period of time by doing a job in government sector. In terms of increments, where private sector considers performance-based appraisals, government sector follows the standardized pattern. Government sector jobs make you a cog in the wheel. Means, you are hired to work on the same repetitive process, leaving no space for creativity. Even if you try to prove your worth, the higher authorities will hardly notice. On the contrary, private jobs offer you an opportunity to be a multi-tasking person. If you have the subtlest idea, your point will be noticed. The more creative you will become, the more opportunities will be given to you, leading to growth. People have a misconception that there is less work pressure in government jobs as compared to the private sector. But this may be a thing of past. These days, aspirants have to face an equal amount of work pressure in both government and private sector. Only a subtle difference can be noticed, i.e. in government jobs workload is equally distributed among candidates, while in private jobs it is divided keeping your previous contribution and potential in mind, which can both be an advantage and disadvantage for you. For all those aspirants, who are planning to start their career, we’ve tried our best to cater you with all the basic information that is needed for giving wings to your dreams in life. Now, the ball is in your court! 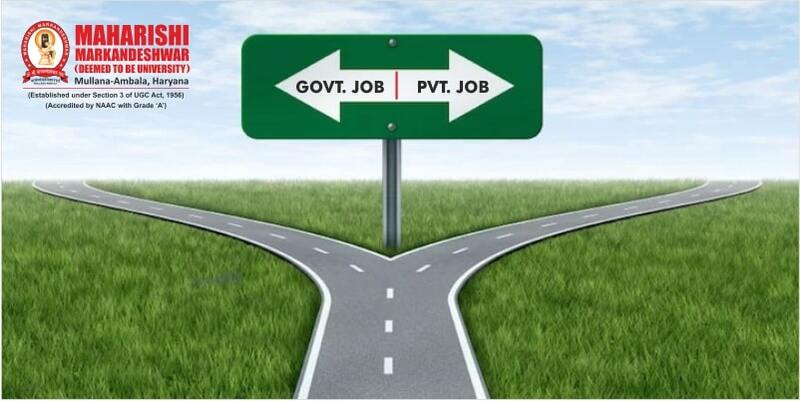 Before finalizing your decision between Government Job vs Private Job, keep the aforementioned points in consideration so that you don’t regret later. We wish you enjoy a happy and successful future ahead.